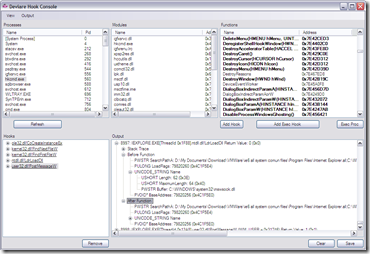 A new version of Nektra Deviare API Hook is now released. This version has lots of fixes to bugs that I found along the last year working with the library in Application Virtualization and Packaging and Reverse Engineering. I found some stability issues, generating dead-locks, stack trace wasn’t working as defined and it has important performance improvements. Also, there are more functions in the database and some data types were not working at all: arrays and enumerations. Functions that are included in the database are displayed with full parameter information. Execution hooks (aka: ‘Add Exec Hook’) allow the user to add hooks when an application starts. It’s useful to debug an application that crashes at startup. Parameter information could be displayed before and after the function is called. Function calls can be displayed grouped by thread. Structures parameters are expanded to show all their fields. 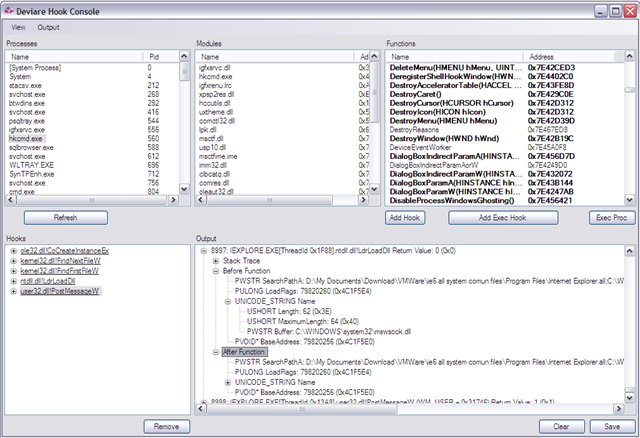 This picture shows a call to Kernel32.FindFirstFileW with parameter _WIN32_FIND_DATAW expanded. Adding other message definitions in that xml will change the C# message handling functions. This method can be used for any other function that has any variable parameter such as DeviceIoControl. Now Deviare COM Spy is part of Deviare Package, so you can get it downloading Deviare. I’m not very happy with the application and I would like to make big changes in this area. Deviare is a very specific tool and it can take a special effort to get acquainted with its mechanism. We have a team of professionals that can help so Just ask. Request the package in Deviare download section.